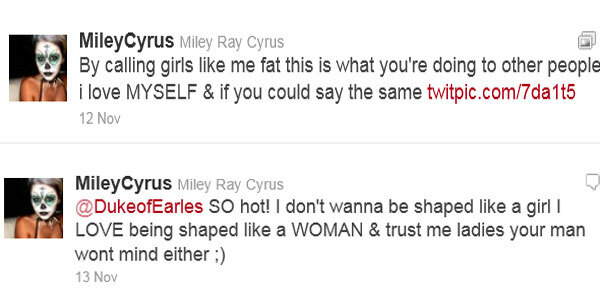 Miley Cyrus is totally sick of being attacked for her curvy bod, and she wants the world to know it! The 18-year-old came under fire recently after showing off a few extra kilos on her tiny frame but she's staying strong, determined to be a positive role model for all her tweeny fans. 'I don't want to be shaped like a girl. I LOVE being shaped like a WOMAN & trust me ladies your man won't mind either ;),' she wrote. We reckon this much body love is super mature coming from an 18-year-old…as long as Miley doesn't undo all the good work with a crash diet anytime soon.